Influence of dietary fats on the concentrations of lipids carried in the blood and the significance for health; Dietary fats and cardiovascular disease; Nutritional significance of lipid peroxidation; The nutritional and biological properties of the polyunsaturated fatty acids; Dietary fats in relation to weight control; Lipids in foods and raw materials. Since 80% of the global production of oils and fats is consumed as food and a further 6% is eaten by animals to produce more human food, it is not surprising that nutrition is one of the active areas in lipid science. For 10 years, Mike Gurr has written nutrition articles in lipid technology amounting to nearly 60 reviews. 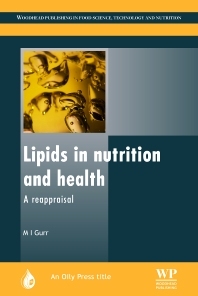 The result is a powerful and critical survey of important aspects of lipid nutrition which will be appreciated by lipid technology readers and should be compulsory reading for those not familiar with the original articles. Areas covered include: influence of dietary fats on the concentrations of lipids carried in the blood and the significance for health, the nutritional and biological properties of the polyunsaturated fatty acids, and lipids in foods and raw materials, among other topics. Michael Ian Gurr, Maypole Scientific Services, Isles of Scilly, UK.